Mures Fishing is an iconic Tasmanian family business that offers our wholesale and retail customers a variety of quality seafood which is sustainably caught and sourced with an emphasis on Australian wild catch, delivered in a timely and professional manner and reflecting the exceptional standard that Mures is famous for. Mures specialises in line fishing aboard our vessel, Diana. We have invested heavily in this practice; implementing Mustad automated baiting systems for our demersal longlining operation in 2002. In conjunction with AFMA, Mures are currently investigating the use of laser technology to further deter the seabirds. 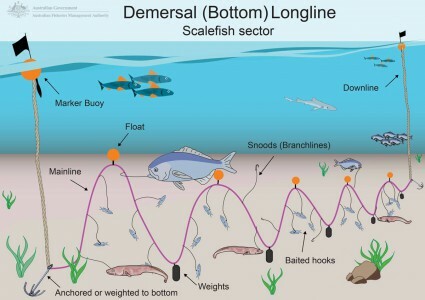 Demersal longlining involves lines of up to 3000 hooks set horizontally, suspended from weights above the sea floor. This method ensures very low impact to the physical environment, specifically the ocean floor. The method of using hooks is considered a “passive” method of fishing where the depth and bait target only the species sought. Most of these measures undertaken by Mures are not simply feel good guidelines that are lost out at sea but are actual conditions of Mures Fishing Permits. While AFMA observers are often on our vessel at regular intervals, AFMA also have access to cameras on board, recording all fishing operations 24/7. Mures fishing vessel, Diana, predominantly fishes in the deep waters surrounding Tasmania. Our catch includes Blue Eye Trevalla, Pink Ling, Blue Grenadier, Ocean Perch and Gemfish. 95% of our fish is sold through Mures Lower Deck and Upper Deck restaurants, Fishmongers at Victoria Dock, Hobart and our Factory Outlets in Cambridge, as well as our wholesale distribution to venues around Tasmania. On occasions, supply does outstrip demand and then we send a percentage of our fish to the Melbourne and Sydney fish markets. During the winter months, Diana heads north to high seas fishing grounds, approximately 300 nautical miles off the New South Wales coast. These colder months are tough fishing with longer trips at sea and rough conditions. But the reward is a range of premium seafood that differs slightly from our summer species which includes our signature Blue Eye Trevalla, as well as Yellowtail Kingfish and King Morwong. More than 40 years on, now owned by Will & Jude Mure, Mures Tasmania remains a vertically integrated Tasmanian business from hook to plate that still loves quality, fresh, local seafood. Mures Tasmania incorporates a 76 foot long lining vessel, Diana (named after Will’s Grandmother), a processing factory, a range of gourmet seafood products distributed nationally and three seafood restaurants on Hobart’s waterfront, Victoria Dock.